Sometimes a work of art must withstand an unexpected test before its completion. ​For a large portrait by Seabreeze High School sophomore Abigail Marais, that test came in the form of a toddler wielding a red pencil. Her work, a portrait of fellow student Austin Neely, was selected by three judges Monday night as the winner of the 2017 District 6 Congressional Art Competition. It will be displayed for a year in the Cannon Tunnel, which runs from the House Office Buildings to the U.S. Capitol. The win is validation of Abigail’s talent and hard work, but also of her ability to adapt to changing conditions. The portrait depicts Austin at a moment when, sitting in the bed of his father’s truck, he had his eyes closed against the bright sunlight. Abigail snapped a photo, which she used as the inspiration for her drawing. “It’s actually my first big colored-pencil piece and what got me into colored pencil and getting familiar with skin tone and everything like that,” she said. The portrait captures a candid moment with lifelike precision, but there is one key difference between it and its source: the color of Austin’s shirt. As it turns out, the deep red helps to bring out the sunlight reflecting from Austin’s face and counterbalances the deep blue of the sky in the upper left of the picture. Abigail said she’s been drawing “forever,” and credits her artistic aunt with inspiring her. “Ever since I can remember, I always saw her drawing with Prismacolors and colored pencils and then I just tried following after her,” Abigail said. 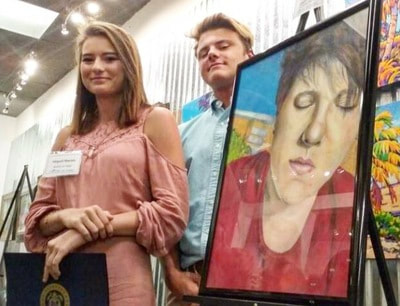 ​Her drawing, “Austin,” was chosen from the work of 10 finalists, all of whom had their art displayed in the main gallery space Monday at Ocean Art Gallery in Flagler Beach. The 10 finalists were selected through a voting program on Facebook. A total 2,157 votes were cast. All of the finalists were area high school students. Six were from Seabreeze High School, three were from Flagler Palm Coast High School and one was from New Smyrna Beach High School. The works were rendered in acrylics, watercolor, colored pencil, multimedia and photography. ​Since 1982, more than 650,000 students have participated in the program. “I’m looking around and seeing quite a bit of unusual work, so it’s going to be fairly hard to actually make a decision,” he said Monday. ​He said the students’ work inspires him as an artist. “I think it’s extremely important that the public sees what they’re doing now, because it’s a glimpse of what they’re going to be like in the future,” he said. The third judge, Jane Mealy, is Flagler Beach City Commission chairwoman. She is a former teacher and art collector and applies her talent to the creation of quilts. She said it was important that, for young artists, such recognition could get them started on a possible career in art. This is the third year Ocean Art Gallery has hosted the reception. Owner Frank Gromling said he would like to hold regular student art exhibits and has begun speaking with local art teachers about the idea. ​Abigail will receive complimentary airfare for herself and a guest to attend an unveiling ceremony at the Capitol.